PVC pipes with belled end according ASTM D2729 Standard Specification for Poly(Vinyl Chloride) (PVC) Sewer Pipe and Fittings. Engineering ToolBox, (2008). 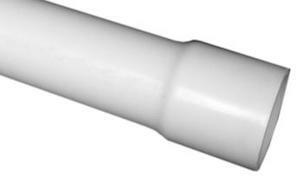 ASTM D2729 - Poly(Vinyl Chloride) (PVC) Sewer Pipe - Dimensions. [online] Available at: https://www.engineeringtoolbox.com/pvc-sewer-drain-dimensions-d_1290.html [Accessed Day Mo. Year].